A perfect family villa if you have small children... pool safety fence, enclosed garden, and some toys..
Villa Bacalao has a superb location on La Torre Golf Resort, close to the on site restaurants and supermarket, just a 5 minute walk. A lovely 3 bedroom, 3 bathroom villa, set in own grounds with large private pool. Villa Bacalao is set on two levels with ample terraces, two bedrooms upstairs (master with ensuite and a twin room with ensuite) and one twin room on the lower level. Both twin rooms have beds that zip together creating king size beds. A cot, highchair and a selection of toys (under 4 years) is available free of charge. 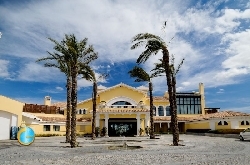 Polaris World Resorts are unique in Spain, with a walled perimeter and a security gated entrance. The resort is ideally located with many places of interest to visit, close to the beautiful beaches of the Mar Menor with miles of sandy beaches famous for a wide variety of water sports, 20 mins to new aqua park, a short drive to the historic city of Murcia, a choice of new shopping malls, plus loads of outdoor activities, horse riding, hiking and cycling to name but a few. 15 mins from San Javier airport. 60 mins from Alicante airport. 20 mins from Murcia City. While staying in this property you will have unlimited use (no membership payable, but green fees must be paid) La Torre's 18 hole golf course. The Club house has a pro shop and bar/ restaurant with terraces overlooking the driving range, entertaining even if not a golfer. There is also an on-site Supermarket.